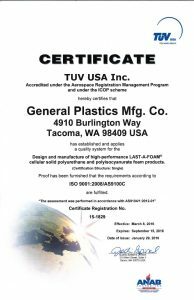 Tacoma, Wash. – March 21, 2016 – General Plastics Manufacturing Company, producer of high-performance polyurethane foam and build-to-print composite parts, is pleased to announce the renewal of its AS9100 Rev C certification. The company first received its AS9100 certification in 2008. The certificate renewal demonstrates General Plastics’ continued commitment to achieve the stringent quality standards required by its aerospace customers.